The central nervous system includes the brain, brain stem and spinal cord and is the main infrastructure for electrical communication in the body. A variety of nutrients are required for normal neuronal development and healthy functioning. Deficiencies of certain vitamins result in reduced cognition and memory, chemical imbalances, oxidative damage, altered moods and even shrinkage of the brain. Vitamin A, or retinol, is required for normal development of the central nervous system and is essential for healthy vision. 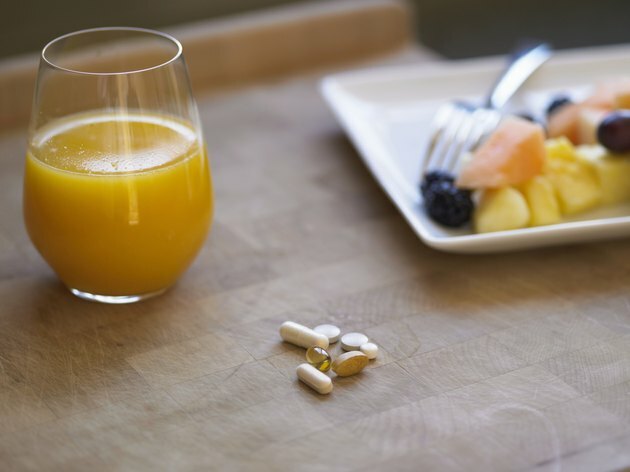 In 1998, researchers at the Salk Institute for Biological Studies found that vitamin A also promotes higher learning and enhances short-term memory. They discovered vitamin A directly affects brain cells, or neurons, in the hippocampus, an area of the brain associated with learning and memory. Beta-carotene, which is found in orange, fleshy vegetables, is converted to retinol within the body. Folic acid, or vitamin B-9, is also essential for the development of the central nervous system, especially during the embryonic stages. According to "Human Biochemistry and Disease," folic acid supplementation during pregnancy significantly reduces the risks of neural tube defects, such as spina bifida. Specifically, folic acid is needed to synthesize and repair DNA, which is especially important during periods of rapid cell division and growth. Folic acid may also protect blood vessels that nourish the central nervous system from oxidative damage. Further, folic acid removes homocysteine from the bloodstream, which reduces risks of atherosclerosis and stroke. Vitamin B-12 plays an essential role in maintaining certain functions of the central nervous system, such as cognition and short-term memory. B-12 is needed for the production of myelin, which forms a protective covering around neurons and increases the efficiency by which brain signals travel to muscle and glands. B-12 also protects the brain against age-related atrophy and shrinkage, and deficiency symptoms are very similar to those with Alzheimer's disease, as cited in "Harrison's Principles of Internal Medicine." Folic acid supplements can mask B-12 deficiency symptoms. Vitamin E is also important for preventing the onset of age-related dementia, such as Alzheimer's, primarily by reducing oxidative stress in the brain. As a powerful antioxidant, vitamin E eliminates free-radicals, which are the harmful by-products of oxidation reactions. A Dutch study published in a 2010 edition of the "Archives of Neurology," discovered that eating vitamin E rich foods delayed the onset of age-related dementia in two-thirds of those studied.